The release of this design is particularly thrilling for me because the cowl is part of the upcoming Quince & Co. Scarves 2013 collection. Quince and Company is a unique yarn company from Maine that provides beautiful wool yarns that are sourced AND spun in the USA. I have so much respect for this company, not only for their business model (which is focused on a sense of responsibility both to the customer and the environment), but for the wearable and modern designs that they produce on a regular basis featuring a wide array of their yarns and so many talented designers. chunky wintry textured knits are what I love! For the sample pictured here (and how wonderful are these professional photos? I feel so lucky! ), I worked with 5 skeins of their chunky, single-ply “Puffin” yarn which you Have. To. Try. Seriously – this yarn was so easy and smooth to work with, and it knits up like lightning on US 13 needles. As you can see from the photos, I wanted the cowl to be generous enough to either wear like a wrap around the shoulders or doubled up about the neck for that ultra-cozy, downtown-girl look that I love. So, at 56″ around and 13″ wide, the cowl can easily do either. 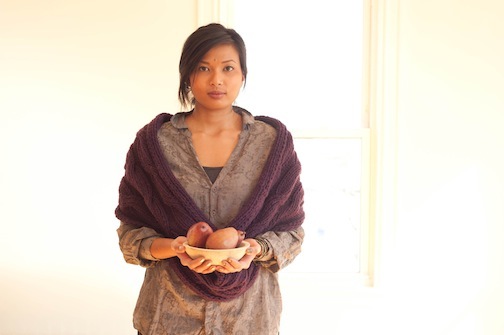 The particular colorway is “Frank’s Plum,” a deep, rich hue that lends the cowl a modern feel: the dark purple almost works as a neutral here and could be paired easily with black, grey, brown, or whatever your winter wardrobe dictates. Not feeling the purple? Don’t worry: they have 40 other shades of Puffin to try instead! Because the three giant cables are ribbed, the cowl is reversible, giving it the pronounced cabled texture you see on the right side, and a more subtle, ribbed effect on the wrong side. And to keep with the reversible ethos, the cowl is knit flat and then grafted together for a seamless result. I know that grafting together different stitch patterns can be a bit daunting, so the pattern provides some online resources that you can use for some pointers on grafting. As I said above, this collaboration was a thrill for me. Working with the folks at Quince and Company was a real treat, as I’m sure anyone who has had the chance to work with them will attest. I have loved their yarns, designs, photography and aesthetic for years, so it was a blast to see one of my ideas come to life with their company. So: where can you find the Arcuate Cowl pattern? The cowl is part of the wider Scarves 2013 collection that will be available starting March 5th. You’ll be able to purchase this pattern individually (as well as the yarn to go with! ), along with any or all of the other outstanding designs from the collection, directly on Quince & Co.’s website, through their yarn shop partners, or on Ravelry. And be sure to check back regularly all this week on the Quince & Co. blog as they reveal the other great designs for this collection – I can’t wait to see them all, especially one from my friend Natalie Servant! I hope that you love this one as much as I do, and I hope it makes the remaining days of winter a much cozier affair!